One of the consequences of having a long career as a cookbook writer is I do a lot of interviews, especially when promoting the latest book. Each interview certainly takes its own course but I’ve realized I frequently get asked many of the same questions. I thought it would be fun to compile the Top 10 most asked and also share my answers with you. 1. What cooking technique was hardest for you to learn? Answer: How to peel an apple. Of course, since childhood, I’ve been able to pare off bits and pieces from an apple with a peeler, but the rapid, professional way to peel an apple using a small, razor-sharp vegetable knife and holding the whole apple with the fingertips of your other hand is something else. You should be able to spin the apple, so the peel is detached in a single, even ribbon. Throw the ribbon over your shoulder and, folklore has it, the ribbon tells you the initial of your next lover. 2. What cookbooks were more formative for you – and which new ones have caught your eye? Answer: Somehow, the most influential cookbooks are always referred to by first names – Julia (Child), Jim (Beard), or Larousse (Gastronomique). I was brought up in England, so Mrs. B (Beeton) was important. When I went to France, Escoffier (Le Guide Culinaire) took center stage, and when I started writing my own recipes, Elizabeth David became a model of clarity combined with background information that illuminated the context of a recipe. Her simplicity of phrase remains a model. As for recent cookbooks, Heston Blumenthal’s Historic Heston takes a brilliant journey into my favorite subject, old cookbooks. And, every time I open covers of the massive Modernist Cuisine by Nathan Myhrvold (who was a student at La Varenne), I am enthralled. 3. What’s the most important cooking advice you’ve ever received? Answer: Never give up! Something that has gone wrong can almost always be saved. Stand back, take a deep breath, and all eventually will be well. 4. How has the way you cook changed since you started your career? Answer: I’ve always been a hands-on cook, no rubber gloves for me! I’ve had to be wrenched into using machines, but now I’m inseparable from my hand-held electric blender, mixer and food processor. I’ve also grown to love my coffee-grinder, which is so handy for grinding fresh spices for medieval recipes. But it’s best to use a separate grinder for coffee and spices so the aromas don’t mix unintentionally. The marble mortar I once used for crushing now has succulents growing it. 5. 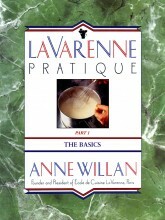 What inspired you to turn La Varenne Pratique into an ebook? 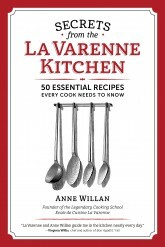 Answer: La Varenne Pratique was first published in 1989 and it is just as relevant today. Information on how to choose a good steak, or the quickest way to chop an onion has not changed. I’ve long wanted the book to reach a wider audience, and to be available at a modest cost, and this gave us that opportunity. 6. What do you like to cook for yourself now? Answer: Cooking in California is a treat. The supply of locally-grown fresh fruits and vegetables lasts all year round. So, we have a lot of salads, greens and seasonal things like: asparagus, green beans, peaches, artichokes and amazing berries. We enjoy fish, whole chickens, split and then flavored with chopped herbs and olive oil under the skins and toasted in a heavy skillet with a foil-wrapped brick on top; the skin comes out wonderfully crisp. I’ve just been blanching some sweetbreads in white wine and water and we’ll flour and fry them in butter for a weekend indulgence. And, we are never, ever, without a good supply of cheese: cow, goat, sheep, hard, soft, fresh or aged – we love them all! 7. How do today’s La Varenne students differ from those of 20 years ago? Answer:Cooking students today are far more knowledgeable than when I started teaching fifty years ago. They eat out, travel and are much more adventurous than in the old days. 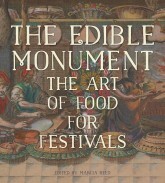 They think of good cooking not just as a trade, but as an accomplishment; even at the highest levels – an art. With the plethora of new, challenging ingredients, and an informed audience eager to try new dishes, we cooks are enjoying a golden age. Answer: Cheese – cow cheese, goat or sheep’s cheese. The huge variety of cheeses is one of the greatest pleasures of France. 9. Is there any food you don’t like? Answer: I hate beets. I was fed a lot of them as a child and I’ve hated them ever since. A second dislike is chili pepper. For me, hot pepper masks the nuances of flavor. 10. What is your go-to snack while you’re traveling and doing book events? Anne’s Answer: Peanuts, roasted and salted, of course. No sense skipping making them taste their very best. at lease I got one correct! haha!